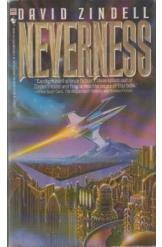 Neverness by David Zindell Sci Fi, good condition, all pages intact. This book is an explosive work of world building. Neverness is filled with complexity and extrodinary beings. This is the story of Mallory Ringess a novitiate of the Order of Pilots. He has penetrated the solid state entity and returns to his native neverness with a stunning discovery.